I mention at the start of the main page for this maker that their history and the history of fountain pens in general is very hard to tell one from the other. This state of affairs, so much as it is true at all, is mainly due to two of Parker’s models– the century-spanning Duofold, and the “51”. I suggest a quick look at a couple of my sub-galleries, one for the era ending with the introduction of this pen and the other for the era in which it had its main existence; you may notice that in the former the “51” stands out as an oddity, while in the latter it is a little bit of an effort to spot anything that doesn’t look like it. This pen, whatever its technical merits, represented a whole new paradigm of pen design, and set the fashion of much of what was to follow. As with most legendary objects, the Parker “51” has more of an Origin Story than a mere history. It is said to have undergone eleven years of research before being deemed nearly ready for production, and there was a year more of pre-production field trials in exotic tropical locales with extremes of heat and humidity (I note, with some wounded nationalism, that there is no mention of testing in places of extreme cold and dryness). This pre-production period began in 1939, a year significant in that it is one of the possible sources of the pen’s name; the 51st anniversary of the company’s founding. There are, however, competing possibilities. One story holds that Kenneth Parker, while pondering a name for this new pen, kept finding that number prominently in his field of vision wherever he went. The Parker factory lay near Route 51. A number doesn’t sound funny in anyone’s language, easing international marketing, and this particular number doesn’t carry any strong negative connotations like 13 or 4. There may be truth to all of these, or none, and I don’t claim to know which is which. I certainly can’t explain the insistence on the inverted commas around the number, either. 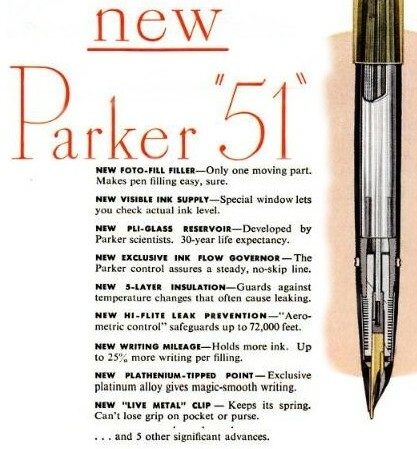 What I can assert is that the “51” looks the way it does not because Parker meant to make something that looked extremely nifty, but because they were trying to make a better pen. One of the drawbacks to fountain pens is the potential for freshly-written ink to smear; it’s untidy, can make a muddle of a sentence, and might stain an incautious hand or elbow. Ink needs to be a liquid, of course, or it doesn’t come out of the pen, so there is a limit to how much one can monkey with the ink to render it “quick drying”. Ink that dries in the feed doesn’t help anyone but pen repairmen, after all. However, if some clever person could limit evaporation speed in the feed, then a fast-drying ink would be less of a menace to the pen, and the best way to accomplish that is to keep the feed inside the pen . That is what the “51” achieved; only the barest tip of the point lies outside the hood. Parker not only released a new pen, they also offered a new ink, one which dried perilously fast, and which would gum up a traditional pen in no time. It was also of an uncommon and extreme pH, which called for unusually tough material to resist dissolving under the influence of the ink which had yet to dry. Parker chose Lucite, a new acrylic plastic, which meant that not only was the pen operating on somewhat different principles than all that had gone before, it was also made of a previously unknown stuff. Released to the general, non-test-market public in 1941, the “51” was every bit the sensation it promised to be; for a modern analogy, one might look to the release of the iPad for a sense of how big a splash an item of communication technology might make on the public imagination. In a similar manner, competing manufacturers were in a sudden scramble to catch up with the stunning new apparition. Another possible reason for the name – ad-men on the rampage! I should probably point out a small throwback included in the design of the “51”. For a long time prior, serious pens and indeed most frivolous pens had held their caps on with a screw-thread. The “51” leaps back some decades with the application of a slip-cap, like those seen on early eyedropper pens. It was, though, not entirely like those old caps, as there was a clutch mechanism inside which acted to grab the body of the pen very positively and prevent the main part of the pen from dropping into the pocket. While these are subject to wear, one may still find “51” caps that go home with a startling click. It was not competition from other pen makers, but rather the entry of the US into the Second World War which presented the first substantial challenge to the “51”. When the country went into war production, a lot of previously plentiful materials were suddenly declared vital to the war effort and rationed where they were available at all. 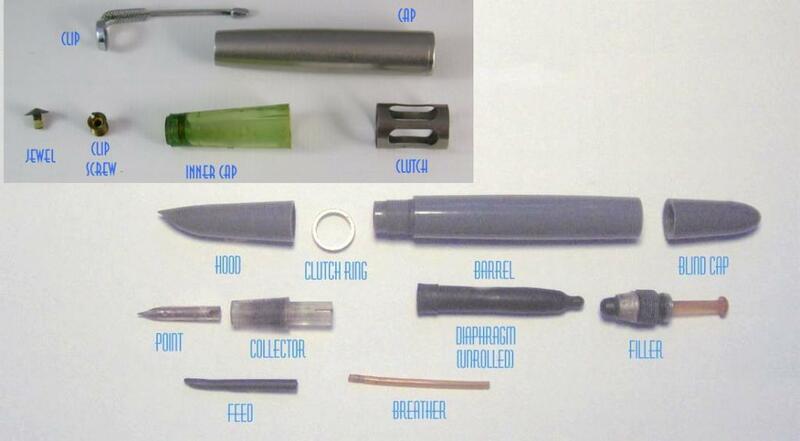 Pens in general contain small quantities of metals like steel, brass and aluminum which are of obvious use in the making of war machines, but the restrictions in these affected all makers equally. Parker’s problem lay in the fact that Lucite was considered of more use to America, Freedom and so forth in the shape of aircraft windows than in that of pens. 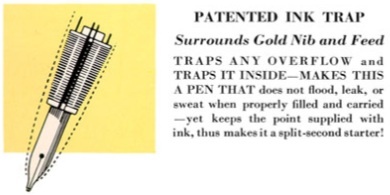 While the “51” was not the only pen of the time made of Lucite, it was the only one which relied upon the material’s chemical properties to function. Rather than abandon the newly-launched flagship pen, Parker made some changes to the filler to reduce its reliance of vital metals (aluminum, mainly) and made a patriotic advertising point out of limited availablity. Parker, pen buyers were told, were doing their part for the war effort by only making a few “51”s and by offering them preferentially to the troops; be patient, you on the home front, and eventually you’ll have a chance at one! I honestly don’t know if there was preference in availability, but the advertising did the trick, and the “51” weathered this early storm in fine shape. There were few other serious challenges for the “51” to face afterwards that were not related to the fickleness of the buying public. The end of wartime restrictions roughly co-incided with the appearance of the ballpoint pen, of course, with all the ramifications of “convenience” that entailed. The only serious change in the “51”, which was less a response to the new pen than one to the growing popularity of air travel, was to the filling mechanism. The “51” started out using the same filler as the Vacumatic it replaced at the top of Parker’s heap, but in 1948 this was replaced with the “Foto-Fill” system, a press-bar rig with a transparent vinyl sac which was capable of withstanding the special ink Parker persisted in offering for the “51” until the late ’50s. This would shortly become known as the Aerometric system, which name originally referred to a small modification of the breather tube to render the filler less perilous in a poorly pressurized aircraft. There have always been various versions of the “51” available. The initial distinction was in the cap, which saw various finishes in steel, silver and gold. A Demi model appeared in 1948, which was somewhat shorter in the body. In 1949, after the change to the new filler, metal-bodied variants appeared: the gold filled Presidential and the brushed steel Flighter. This latter was inspired by the appearance of a plane used by Kenneth Parker, and was the first appearance of this style of trim in Parker pens. In 1950, a reduced-rate “51” Special was introduced; it differed from the base model “51” in that it had a somewhat more open filler, rather like that on the “21” and the “51” Demi, its cap jewel was black rather than pearlescent, and its point was made of the same “Octanium” steel alloy was those of the “21”. Having tried both gold and Octanium points, I would say there is no functional difference between them in this pen. Aside from trim levels, there are three different styles of “51” with the Aerometric filler, which in a manner similar to the “21” are referred to as marks in the shorthand of collectors. The Mark I version is essentially a continuation of the body shape of the Vacumatic pens, and persisted until the mid-1960s. The Mark II pattern sees an emulation of the profile of the 61, with the end of the barrel changing from a rounded silhouette to a low, conic shape which mirrors the cap jewel. The Mark III, appearing right at the turn of the decade, sees the clutch-ring shrink to a very narrow and merely decorative object, and the shape of the clip become more elongated. The “51” remains a very popular pen. The more serious collectors enjoy the wide range of sub-types and finishes, while the user/collectors (in whose camp I stand) appreciate the degree to which the original functionality is maintained. I am not, I will admit, an ardent fan of the “51”, as that sort of person in their description of the pen give one a sense that shafts of light come from nowhere to illuminate the pen as it’s being used, and one can feel the hands of angels supporting the writing hand. Paying too much attention to that adoration is apt to result in disappointment, as it is really just a rather good pen. I think it and its designers are due a certain degree of respect for making a pen that minds its duty so well– the Aerometrics are in many cases just waiting for someone to flush them of old ink before being as good a writer as the day they left the factory. The one drawback to these pens is that the collector acts as a very efficient trap for fluid, as it was designed to do, and renders flushing an exercise in patience. This is especially true of the Vacumatic fillers, with which one might well set aside an hour for flushing. The reader of the preceeding may have a sense that a great deal of information has been given them on the topic of the Parker “51”. I decline that perception, and suggest that for a full examination of this pen one should have a look at Parker51.com. I’ve scratched the surface, but that site lifts rocks and peers under foundations. Cost When New: Depending on trim level, the first year of the “51” cost from $12.50 to $50.00, not including desk sets. The Aerometric’s first outing ran at $13.50 to $49.75. A 1978 catalogue lists the 51 Classic as going for $20.00, so that Argentine production wasn’t being sold only in Argentina (for modern values, try this calculator). Standard-sized Vacumatic filler: 13.6cm long capped, 15.0cm posted, 12.5 uncapped. Standard-sized Aerometric filler, Mk. I: 13.6cm long capped, 15.0cm capped, 12.5cm uncapped. Desk mount Vacumatic: 15.3 cm point to tail. Desk mount Aerometric: 15.2 in the early examples, growing to 16.1 cm by the late 1960s. Demi Aerometric: 12.6cm capped, 14.0cm posted, 11.7cm capped. Point: 14k gold, except in “51” Special, where it is steel (or “Octanium” for the pedants). There is also a very small minority of points produced in France which are 18k to comply with the rules there about what one is allowed to call gold. Body: Lucite, although I believe I’ve seen somewhere that Mk.III was not; as I can’t confirm that, I’ll not make any other note about it. Some models were metal-bodied. Filler: Vacumatic in early models, capacity approx. 1.5 ml (the collector’s tendency to cling to fluids makes this more than usually approximate); Aerometric standard-size capacity approx. 1.5 ml, demi approx. 1.2 ml (with the same caveat). Desk pens have the same capacity as the standard size of the same filler. One may find an example with a button-filler of a sort (made about 1946) or a cartridge-filler (about 1961 – ’63). Canadian-made 1948 Vacumatic model with gold-filled cap. Note the change in clip, which would persist until the Mk.III Aero. Note also the dirty great dent in the cap, one of the more standard blemishes in the “51”. 1949 base model (Aerometric) in Forest Green, showing the other popular “51” deformity, the clip-swipe. 1951-1958 in Midnight Blue, which is actually a little darker and lacks the greenish cast of the earlier Cedar Blue. The dating is based on the fact that the filler is stainless steel rather than chromed, and still has a mention of Superchrome ink. This may be a Super “21”, but the exterior trim suggests something made in the late 1960’s, after the “21” was put to bed. I will, despite lack of catalogue references, call it a “51” Special desk version. 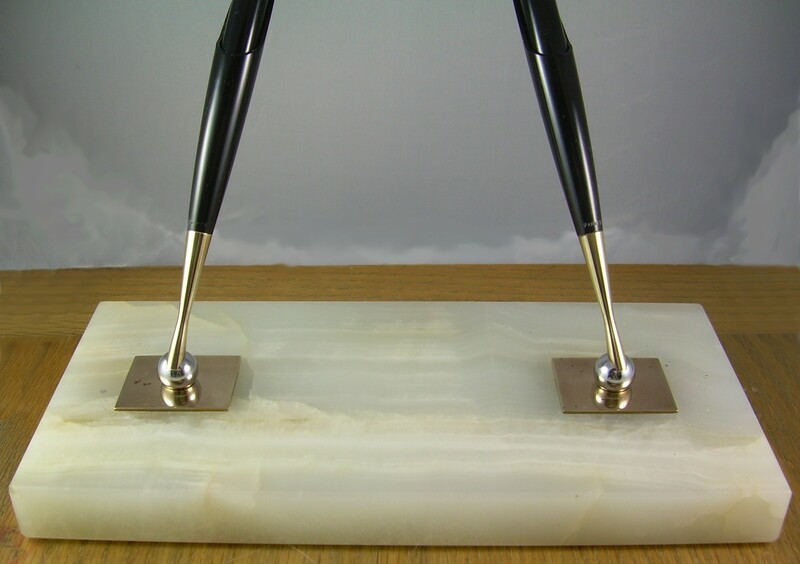 The twin-base for the above pen, showing Parker’s rather clever Magnetix sockets, which are free of the wear problems most desk-set pivots succumb to. According to the 1968 catalogue, this set would have cost $51.00; how’s that for a coincidence? The “51”, with a similar combination of iconic status and durable reliability, has become something of a VW Beetle of pens complete with non-factory body kits; this is an after-market “Fantasy Demonstrator” exterior made by Argentine fabricator Ariel Kullock.